I'm visiting friends this evening. I've just made these yummy sweet breads with icing on top. Great for a sweet breakfast or for a treat with a cuppa. The bread recipe is a white bread mix with caster sugar added in. Making and kneading the dough stage is the longest part and of course letting time for them to rise. Baking only takes about 10 minutes. And once cooled, your icing is a matter of minutes. 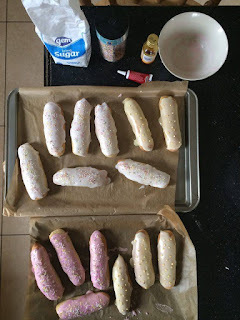 You can make these in advance for a tea party or when you know you are going to be visiting. You can just ice them then the next morning. Or, you can freeze them un-iced until when you want them. It's always good to have a press/cupboard stocked up and this is the reason i always have mine stocked. You can make something up then at a moments notice. Note: Kneading is a very important stage of any yeast bread making, to get that yeast and sugar working. Don't be lazy! Sift 250g plain flour and 250g strong bread flour into a large bowl. Add 1x 7g sachet dried yeast and 1tsp salt and stir to combine. Make a well in the centre. To this you will add your mix of 50g softenend butter; 1 egg beaten; 30g caster sugar and 100ml milk. Stir to combine gradually adding 175g tepid water until the dough is soft and sticky. Turn the dough out onto a floured clean surface. Knead dough for 10 minutes. Leave the dough in lightly greased bowl with a clean t-towel over it and let it sit in a warm place for about 1 hour, to rise or double in size. Knock back (literally turn the dough out onto floured surface again and punch the dough!) the dough and divide it into 14 pieces. 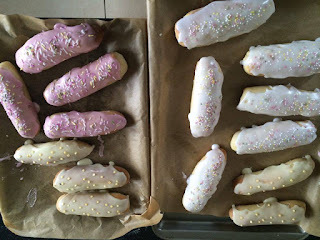 Roll each piece into long finger light rolls approx 12-14cm long and leave on a baking tray, lined with greaseproof paper, for another 30 minutes, or doubled in size. Leave enough space between each roll to rise. Preheat oven to 180degrees for a fan oven (200degrees otherwise). Bake for 8-10 minutes then or until lightly brown. Leave to cool. For the icing, sift 250g icing sugar into a large bowl. Add 2tbsp water and mix. (I had plenty in this and did not need to add more water. It should be quick thick that it doesn't drip but spreadable enough too). Divide mix into 3. You will now make pink icing (using red colouring) and yellow icing (using yellow colouring) or of course any other colours you choose. As it's Easter very soon, i chose yellow, pink and white. To add the colouring: take a tooth pick, dip into the colouring you want, put the tooth pick into the into icing mix and mix. You can always add another drop if it's not dark enough, but you cannot take away! So, start this way and build up. But i found just 2-3 dips into the colouring was enough. 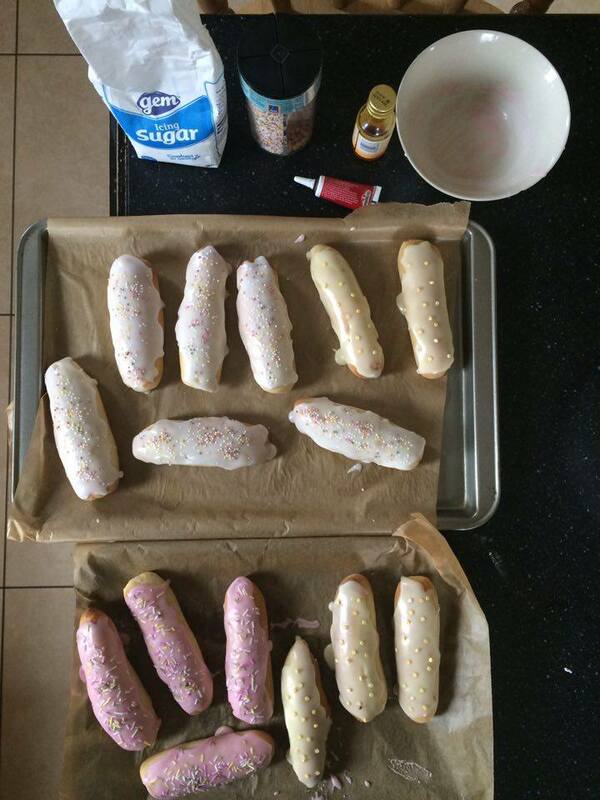 Spoon the icing over the fingers and decorate with sprinkles of choice. Leave to set on your lined baking trays again. And......Enjoy!